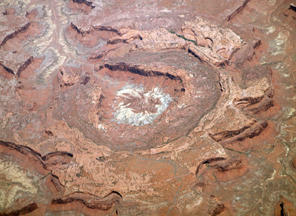 The unusual shape of a noted geologic feature in Utah’s Canyonlands National Park becomes fully clear only from the air. From a small plane, Upheaval Dome seems to have collapsed. On the ground, geologists have puzzled over the dome’s origins for some time—but lately they’ve found a convincing clue. Upheaval Dome is built of concentric cliffs of different, colorful rock layers—Navajo Sandstone at the periphery to the oldest rocks at the core, the Cutler Group and Moenkopi formations. The largest, outer ring measures three miles across with walls towering a thousand feet above the central floor. A jumbled lower peak—the actual dome—squats dead center. One scenario credits salts from the underlying Paradox Formation—deposited about 300 million years ago—as the formative agent. They became “plastic,” were squeezed upward by the weight of overlying layers, and congealed as a dome—it could take twenty million years of moderate pressure for such a gigantic “salt bubble” to appear. Another scenario supposes a meteorite hit the earth, and the crater formed instantly under extremely high pressure, similar to Meteor Crater in Arizona. But geologists did not find saline rock or related minerals at the surface to support the salt dome hypothesis. They hadn’t found molten, fractured, or ejected material either to prove a meteorite hit—until recently. In 2007, German scientists discovered “pressure-shocked” quartz crystals off to the side that could only have been caused by a violent impact. The meteorite itself could lie deeply buried in the dome, or have shattered and been eroded away. Throughout the Southwest, range riders camped in stone hollows for the same reason they wore broad-brimmed hats: to shelter from rain, wind, snow, and the sky’s fearsome glare. The San Francisco Volcanic Field in northern Arizona is full of spiky lava flows. Some seem as fresh as if they were laid down yesterday. But how old are they, really? Scientists are now dating these ancient volcanic eruptions with a method that involves a curious kind of clock—the cosmic rays emitted by stars.  When people think of sage-grouse, they may think of them as birds of far northern valleys swathed in grey-green sagebrush. But there’s a distinct—and lesser-known—species that lives south of the Colorado River in Utah and Colorado. It’s the Gunnison sage-grouse, a smaller cousin of the greater sage-grouse.